Many people wish they could be more organized. 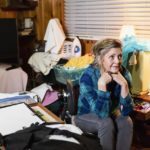 Whether you’re an older adult who has downsized (or perhaps you’re enjoying a freshly-empty nest), a college student with a ton of belongings crammed into a very tiny space (that you just happen to have to share with a roommate), a young couple just beginning a life together and wanting to start out on the right foot with an organized home, or a frazzled parent who sees no end to the nonstop cycle of cleaning up while your kids are in the process of making an even bigger mess, this guide’s for you. Because so many of us want to be more organized, but simply don’t know where to begin, we’ve put together this comprehensive guide to organization hacks for every room of your home. Why get organized? 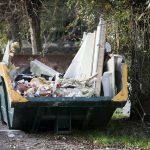 Well, for starters, you’ll save tons of time you’d otherwise spend sorting through the clutter to find what you’re looking for. Not to mention, a clutter-free home is less stressful – both for you and the rest of your family (or roommates). Even if you live alone, these life hacks for room-by-room organization are sure to leave you feeling more relaxed and accomplished. The information and resources in this section will have you on your way to an organized, spacious living room (no matter how small) that suits the many purposes for the space. Prioritize flow. When designing the layout of your living room (or any other space, for that matter), think about how you’ll likely move through the room and ensure that your furniture layout doesn’t interrupt the natural flow of traffic. Set up different areas depending on how they are used. For example, if you use one area of your living space for watching television, designate an area for this purpose with seating, and create a separate area for socializing and conversing with friends and family. Install some ceiling shelves to store things like books, picture frames, and other items that you probably don’t need to use every day. To take advantage of this tip, install built-in shelves that hang down from the ceiling. The best part of this hack? All that shelving space takes up zero needed space, and it looks pretty nice, too. This hack can be used in any room in the home. An adjustable table pulls double-duty as a coffee table and kitchen/dining table. Short on living room space? Does your living room often double as your dining room, with your family enjoying meals while relaxing and watching TV? If that sounds like you, this adjustable table hack from Lifehack.org is your dream come true. Disguise and hide unsightly items like litter boxes inside furniture. Got cats? Small living space? No problem. This article explains that you can hide both the box and some of the unpleasant odors that come with it by hiding it discreetly (but within kitty access) in a cabinet. Store magazines and books in decorative baskets, and use open shelving to store both books and a few decorative items. This article also offers tips for minimizing clutter by sticking to one decorative theme and not showcasing too many different collections. The kitchen is one of the most difficult-to-organize areas in the home. The tips and resources in this section will help you figure out how to store all those pots and pans, organize your ever-expanding lid collection, and discover more storage space where you didn’t think you had any. Follow this guide to organize your refrigerator like a pro, placing different types of items on the shelves and in the drawers where they’ll fare best. Of course, having a place for everything means no more fridge clutter and no more endless searching for that jar of pickles that’s stashed in the back of the fridge behind a few dozen other containers. Check out this article for a before-and-after refrigerator makeover. If you’re looking for more refrigerator sanity-saving advice, The Kitchn offers up some professional fridge organization suggestions, too. Attach a magazine rack to the inside of a cupboard to easily store those pesky lids for your pots and pans. Few things in life are more frustrating than trying to find a place for all those loose lids among your carefully stacked pots and pans; this hack from Get Organized Wizard saves the day. A lazy Susan is the kitchen organizer’s must-have tool. These can be used in any cabinet to make items more organized and easier to reach, but they’re a definite must for storing sticky or easily spilled items. That’s because you can quickly pull out and empty a lazy Susan for a good cleaning, while cleaning the inside of a kitchen cabinet isn’t always so speedy and straightforward. Use tension rods to create dividers in kitchen cabinets. This allows you to place things like cutting boards and baking pans in their own slots, saving you time digging through a stack of kitchenware every time you need something. Take charge of your kitchen junk drawer once and for all. Add a drawer organizer and group like items together. Small containers work wonders for keeping tabs on your supply of tiny items like pushpins, rubber bands, paper clips, and twisty ties. Use that tiny space between the refrigerator and the wall or cabinets it sits next to as a thin, vertical storage option for small items like spices. This article shows a great example of a slide-out storage option created with a fashionable chevron pattern to spice up the look. Paint the inside of a pantry door with chalkboard paint and use chalk to keep a running shopping list that never runs out of paper. As a bonus, it’s out of sight when the pantry is closed, and even if a guest catches you with it open, the chalkboard trick makes it both chic and classy. 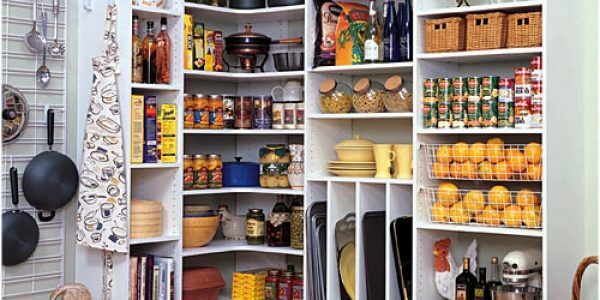 The “zone” concept works exceptionally well for organizing your pantry, as well. This article from Better Homes and Gardens breaks down the how-to. And don’t forget to de-clutter and purge all those expired and outdated items. Store your measuring spoons in a jar near the stove. This makes them easy to grab in the moment as they’re within reach, and it looks both cute and orderly. Offices are often among the most cluttered areas of the home, with mail, documents, files, and office supplies galore to sort, stack, and keep track of. The information and resources in this section will help you figure out how to maximize your storage space, create storage even if your office has no closet, and keep your desk clutter-free. Establish work zones. Like designating areas of your living space for certain activities, the same can be achieved in your office space. Where do you file papers? Where do you work at your computer? This article suggests a main workspace, such as your desk, a reference area for filing cabinets, binders, and shelves, and a supply area, which may consist of a closet, shelves, and drawers. Use a combination of bins and shelves to organize. This is especially helpful if your office space lacks a closet for storage. Bins can be anything that coordinates with your office décor, such as baskets or sleek metal bins, and you can label them with attractive tags or signs so you know exactly what belongs where. What to do with all those magazine articles you’d like to save for later reference? Create a separate storage file for dated, long-term storage, or scan them into your computer to cut down on the amount of paper you need to find space for. This article also offers additional tips for keeping not only your office organized, but your workday, too. Keep two document trays on your desk: one for items that have just come across your desk that need to be reviewed or dealt with, and another for items you’ve already looked at but still need to address. Color-code your filing system. This article suggests a color-coded filing system for easily keeping track of what documents relate to what, so that you can easily find important files when you need them. HGTV suggests five color-coded categories, including green for financial documents, red for medical documents, orange for personal documents, yellow for insurance, and blue for documents and files related to your home. A mini magnetic strip bulletin board is the perfect tool for attaching important notes and memos right by your desk. This article also offers an abundance of organization tricks and hacks for organizing files, prioritizing email, and more to keep your work space in check. Stack mason jars in a pyramid-like shape on their sides to create instant, organized storage for pens, pencils, markers, and other odds and ends that you need to have at arm’s reach on top of your desk. This setup will match practically any décor, and it keeps your essential items both organized and readily available. Get a label maker that’s easy to use. It will become your partner-in-crime. Labeling everything means that everything has a designated space – including sections of drawer dividers, shelves, bins, cabinets, filing cabinet drawers, and even individual cubbies in your desktop organizer. Your bedroom should be a clean, clutter-free, serene space where you can relax. Too often, it’s a catch-all for clothes that don’t fit in the closet, laundry that needs to be done, and stored items that somehow seem to keep creeping out from under the bed where you thought they were out of sight, out of mind. These tips and resources will help you gain control over the mess once and for all. Make use of your vertical wall space by adding some built-in shelves that add both a charming, classy look and valuable storage space. This article also offers suggestions such as building a custom headboard that offers built-in storage. Don’t waste the space under your bed, but do keep your under-bed storage organized. It’s easy to take the “out of sight, out of mind” approach and simply stuff unneeded items under the bed, but you’ll be much happier when you can find what you need without sorting through endless piles of shoes, slippers, and out-of-season clothing (not to mention the dust bunnies that will inevitably come along for the ride) just to find one item. To keep it organized, store like items together in labeled containers with lids (to keep those dust bunnies at bay). Make your own DIY storage ottoman using simple wooden crates. Whether you place it at the foot of your bed or use it as a coffee table for your living room, this crafty piece of furniture also doubles as a storage area. Old-fashioned trunks and metal suitcases, which may have been passed down to you from relatives, can actually make beautiful decorations as makeshift coffee tables or corner accents. And, here’s the great thing: They hold stuff, like blankets, unused seasonal décor, and other items you don’t need often. Use a shadow box or empty paint palette to store (and display) your frequently worn jewelry. This article from Martha Stewart offers these and several other clever hacks to keep your bedroom clean, organized, and pleasant on the eyes. In a spare bedroom that doubles as your office space or fitness room, a murphy bed with sliding doors and storage could be the perfect solution for a functional, multi-purpose space. This article from Lifehack.org explains how to set it up perfectly, giving you added storage space and concealing the bed when it’s not in use. Closets tend to get a bad rap. 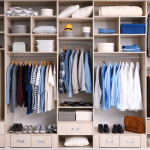 If you dream of having a color-coded, ultra-organized closet in which all your shoes are perfectly situated, your clothes fit neatly on hangers, and where you can find precisely the shirt or pants you’re looking for on a rushed weekday morning, the following tips and resources will have you on your way to closet utopia in no time. The Discardia Closet Trick is just the hack you need to eliminate clothing that you no longer wear (because we all know how difficult it is to let things go, even items that have been loitering in your closet for years with the price tag still on). How do you do it? Place all clothes facing the same direction on the hangers, and every time you wear an item, turn it the other way. After six months, anything that’s still facing the original way hasn’t been worn and must go. Color-code your clothes and store similar-colored items together. This may seem a little obsessive, but you’ll thank us later when you’re looking for the perfect cream-colored top to pair with that skirt and know right where to find it. Plus, your closet will look like an orderly, lovely rainbow. Most-used items should be stored at eye level in your closet. The less often you use an item, the higher up you can store it on your closet shelves. Lose the shoeboxes. 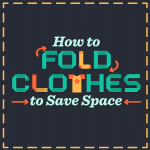 They take up too much space, and they don’t make for a visually appealing space – even if it is your closet. Instead, save a ton of space by turning the heel of one shoe around to organize pairs. Make your own scarf hanger easily to keep scarves from becoming tangled and damaged among your clothes or bunched up in a drawer. All it takes is a wooden hanger, some shower curtain rings in various sizes, and a bit of glue and wrapping thread or embroidery floss, and you’re well on your way to a super-organized and orderly way to store your growing collection of scarves. A DIY rack to store your tights makes it easy to find just the pair that perfectly complements your outfit each day. Lana Red offers a how-to tutorial on the simple steps needed to create this ultra-organized and chic wooden clothes pins rack to tidy up your tights. Learn how to fold – really fold – those fitted sheets. It really is possible to fold these frustrating-but-necessary sheets in an orderly fashion that doesn’t end up looking like a 6-year-old rolled it into a big, wrinkled ball and crammed it into the remaining space on an already-cluttered shelf. This article shows you exactly how to get it done. Dining rooms are often multi-purpose spaces that are used for more than just sharing a meal. Some families pay bills there. Others have kids who do their homework at the dining room table, thus leading the space to become the catch-all for backpacks, boots, coats, and other items (not to mention the daily collection of junk mail that arrives in your mailbox). Get your dining room under control and take it back as a useful space again, no matter what you use it for, by utilizing the tips and strategies offered in the resources below. Don’t let your dining room become your catch-all space. This often happens in homes where the dining room is used for special occasions, but on regular evenings, the family eats in the kitchen or living room. 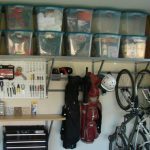 Allowing the space to become the default repository for backpacks, coats, paperwork, and other odds and ends is a recipe for clutter – unless you design and implement a plan to keep it all organized and in-check. Define what your dining room space is and what it will be used for. 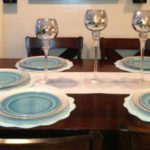 Do you pay bills at the dining room table? Do your children do their homework here? It doesn’t matter how you use it, as long as you understand the various purposes the room serves – allowing you to designate the right storage and organization options to keep it all orderly and functional. Sideboards and buffets make the perfect complement to dining room décor and offer some valuable storage space in a room that typically doesn’t start with much more than four bare walls. These pieces of accent furniture not only make the dining room more visually interesting, but they provide the ideal space for storing fine china, everyday dinnerware, and other items. If you have a large dining room set, consider moving unneeded chairs out of the room when you’re not using them to reduce clutter. Most families don’t need 12 chairs around the dining room table at all times. This article also suggests using a bench for storing backpacks and other items if your dining room serves as a homework area, as the bench can be pushed back against a wall. Even if your bathroom is spacious, you probably still struggle to find an ideal place to store the many items you might need in your bathroom, which may include towels, linens, makeup, curling irons, and toiletries. The following resources offer information on devising clever storage strategies to keep the clutter off of your bathroom countertop while still keeping those necessary items within reach. Let go of old, tired products. We tend to hang on to products like lotions and gels for far too long (often because they were costly and we can’t bear the thought of wasting them), but these products don’t work as well after they’ve become outdated. If any product is discolored or doesn’t smell quite like it should, it’s time to toss it. Organize your medicine cabinet. Try self-adhesive, flat-backed cups that attach to the inside of the cabinet door for storing things like toothbrushes, brushes, combs, and toothpaste, which don’t fare well and create clutter when stored flat on a shelf. A metal file box hung on a wall near the sink area is great for storing items like hair dryers and curling irons, as they can’t be tucked away while they’re hot immediately after use. A metal file box, on the other hand, can accommodate these items even when they’re hot to the touch, and they won’t clutter up your vanity top all day long. A shower curtain rod and towel bar combination can be just the solution for hanging towels and other items to dry without leaving them on display in your bathroom. This option means they’ll hang subtly behind the shower curtain, where they can drip dry into the tub. Open shelving, which is becoming more widely integrated into modern bathroom designs, provides the perfect combination of aesthetics and storage space. These areas can be used to store lotions, towels, and other essential bathroom supplies. Store bobby pins in a spruced-up tic-tac container. Are your bobby pins always disappearing, or worse, left haphazardly around the house? This tic-tac container hack from Lovely Indeed solves the bobby pin struggle for good. Mason jars cleverly attached to a rustic wooden board (or chic, modern backdrop of your choice) provide a simple, cost-effective, and attractive solution for storing loose items like Q-Tips, cotton balls, and makeup brushes. By hanging the jars on a wall-mounted shelf or backdrop, you’ll reduce the clutter from your bathroom counter while adding some visual appeal to your bathroom. Any family with children knows it’s far too difficult to keep up with the endless cycle of picking up the mess while your kids are busy creating an even bigger one. But with the strategies and tips you’ll find in these resources, you might just create the perfect play space that’s so clever, your kids think picking up is FUN. Organize the room with a focus on access, using the 80/20 rule. This article suggests storing the 20 percent of items your kids use most frequently in easily accessible areas, while the remaining 80 percent can be less accessible. Containerizing is key. Containers can be used when you’re in the purging process of getting rid of old toys and other knickknacks that accumulate in the play area. Use four bins or containers: keep, donate, trash, and other room. Then sort the items accordingly. When you’re done purging, organize everything you’re keeping into containers – small cups, big bins, whatever works – and label everything so there’s a place for everything. Don’t forget to make sure your kids know how to put everything in its place so the area stays tidy! Labeled drawers – labeled by day of the week – are the perfect solution for keeping track of what equipment and gear your kids need to remember to take to school or practice each day of the week. No more forgetting essentials at home or making unplanned trips to your child’s school to drop off forgotten after-school practice gear. Another genius hack from this Buzzfeed article is to store puzzles in zipper pouches to save space. A wine rack makes an excellent solution for storing art supplies like markers (and it’s also a super useful hack for organizing pens and other loose items in your office). A tabletop wine rack and some affordable dollar-store plastic or glass cups of your choice, and you’re all set. Repurpose a garden stool as a ball storage container, or a dish rack as a book storage rack. This article showcases some brilliant ways to repurpose items from around the house for better playroom organization. Sort and organize Legos by color in simple white or colorful, coordinated bins. On Lego overload? This organization hack from Architecture & Design offers a clever solution for this and other common playroom clutter challenges. Make playroom cleanup fun. When you get your kids involved in the cleanup process and make it fun for them, they’ll be more likely to want to pick up in between major cleaning and organizing days. Don’t let your laundry room or mud room become a cluttered mess. Rely on the tricks and tips in the resources below to design your laundry area to maximize available space for a functional laundry room. Maximize the space you have by keeping your workspace as simple as possible. Shelving such as that over a built-in washer and dryer provides valuable storage space without blocking windows. Designate a work surface – other than the top of your dryer, which is probably covered with lint. Instead, designate a table, countertop, or other flat area where you have space to fold laundry and sort it out. Get a laundry hamper with compartments so you can sort while you undress, saving you time on laundry day. These compartmentalized laundry bins are often collapsible or on wheels, adding even more functionality. Use a basket, bin, or caddy as a designated “cleaning caddy.” Store all your cleaning supplies in this caddy and keep it within easy reach, such as on top of your washing machine. Washer and dryer pedestals are a must. You can make one yourself for far less than you might spend buying one at the store, and they add tons of built-in storage space where you can place baskets of laundry or supplies. Hang up a cute change jar to add style to your laundry room. This provides a handy way to collect all that spare change you find in your pockets – which might help fund your next DIY project! If you’re living in a college dorm, we didn’t forget about you. We know how challenging it is to try to fit all the belongings you might possibly need in such a small space. Not to worry; the tips and hacks in these resources will have your roommates and neighbors asking you for organizational tips. A little side consulting business while you go through school, perhaps? A plastic shoe storage rack makes the perfect over-the-door, organized snack storage solution. While your roommates might dip into your stash, you’ll be sure to know exactly where your favorite snacks are, when your supply is running low, and keep all the snack-y clutter from messing up the rest of your dorm. This article has some other helpful dorm room-organization tips, too, such as using soda can tabs as handy closet-space expanders. How? Slip one over the hook of a hanger, and hang another hanger from it. Because the hangers aren’t side-by-side on the bar, they’ll take up less space. A sturdier shoe rack is also a must for the bottom of your closet, so you can keep your shoes neatly organized in pairs rather than spend the last few minutes before class frantically searching for your matching shoe (the only pair that goes with your outfit, of course). Chair pockets don’t take up much space – in fact, they save a lot of space you’d otherwise use for notebooks, pens, pencils, and other school supplies by storing them right in the back of your chair. There are few innovative ways to use the back of a chair, so why not use it for something useful? Make a geometric memo board. It’s cute, fashionable, and affordable to make. Plus, it will save you from endless notes and paper clutter strewn across your desk. Don’t use the same old t-shirt folding technique you’ve been using for years (unless your mom is an organizing genius). 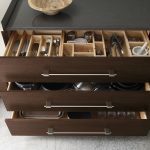 Instead, follow this strategy from TheGloss.com to maximize drawer space. If you’re visiting home at the right time, take summer clothes back home to store them and bring your fall/winter wardrobe back with you. That means you don’t have to find room to store out-of-season clothes that you won’t be able to wear anyway. This article also offers additional tips for dorm room organization, including coordinating with your roommate in advance so you don’t double-up on items you only need one of, like a microwave, refrigerator, toaster oven, or television. Organizing your entire home, apartment, or dorm room doesn’t have to be a nightmare. With the organization tips and hacks in this guide and the resources included here, you, too, can have a home that looks as though it came straight from the pages of a magazine – or perhaps your favorite Pinterest board! OMG! I want to do that to my house. I love the shelves for the kitchen. I have this useless empty hallway I could do some of that too! Love the pull out drawers for under the sink! Need that too! Oh and man I love the closet! So I’m clicking like & adding it to my Evernote as a thing to do!